Celebrate rains in style. Decorate your hands with Teej special nail art designs that speak of monsoon and festivities! The beloved festival of Teej is here and it’s time to celebrate the monsoons and the union of Goddess Parvati and Lord Shiva. Henna decorated hands, colorful dresses, delectable sweets are a big part of the festivities. So how about adding a little bit of a fun style to your nails as well? 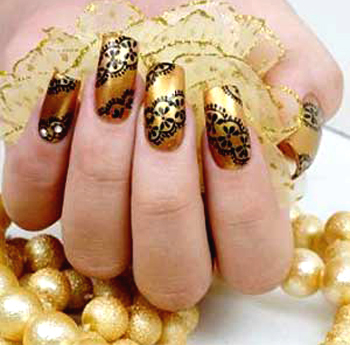 Try out some stunning nail art designs this Teej and give everyone a reason to stare enviously at your hands. Here are some lovely and beautiful nail art designs you can try at home this Teej. You can try big bold patterns, criss-cross lines or even delicate lace patterns on your nails to give it a stunning finish. Apply a base coat in the color of your choice and using a thin brush or a toothpick draw the desired patterns across the nail tips. You can draw it on each nail, or vary it on each finger to give it an interesting style. Ombre, the style which uses gradation of color, is no longer limited to just clothes and hair. It is a hot trend in nail art and is being replicated by many people world over. Opt for a beautiful ombre style nail art in cool colors such as blue for Teej this year. Apply a dark coat of nail polish at the base and use lighter shades as you move upwards on the nail. Then using a makeup sponge, blend the colors together to give it an impressive ombre style. For the more complex patterns and designs, you can opt for a stencil to give your nails a high fashion look. Paint your nails in a beautiful color and let it dry. Hold a stencil over the nails and paint over it with a contrasting color or a metallic one like silver or gold. You can use a stencil for the more intricate veil patterns which are very traditionally Indian and appropriate for a festival like Teej. To give your nails a colorful look, start with a base coat of white nail polish. Then using nail polish in all the colors of the rainbow, paint your nails in an abstract manner. You can use toothpicks to create consistent patterns or just brush it randomly across the nail to create unusual patterns. Flaunt this style for everyone to see, and you are sure to be a fashion icon at the party. Once you have painted your nails with a basic color, or given it an ombre effect, add dots of glitter, or sequins and other embellishments to give your hands a little bit of sparkling style. When teamed up with sequined lehengas or salwar kurta’s this makes for a beautifully traditional style.